Sometimes it is required to get the unique ID of android device (phone, tablet, tv, wear) while developing the android application. If you are looking to find/get the unique ID of an android device or having trouble in finding your device or android app installed in the device. 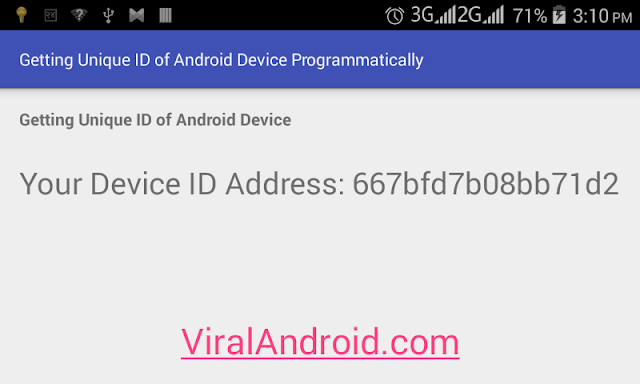 In this tutorial, you will learn to get a unique ID or serial number of an android device programmatically. There are many ways to find and get android device unique ID. Here I am going to show the simplest and easiest ways to get a unique ID of an android device and display it in TextView. Following is the code of Java activity file and xml layout file. Following is the little bit java code to get the unique ID of an android device. That’s all. Now, run your Getting a Unique ID of Android Device Programmatically application, you will see the unique ID of your mobile in the screen.